Food tastes so much better when you smoke it. If you are up to the task but worrying that it may be too complicated for you, then let us introduce to you a simple solution to your problem – go buy a pellet grill and smoker. 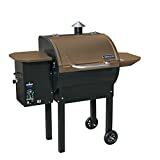 These smokers and grills have become very popular in recent years, as consumers realize how easy and convenient they are to use. While you may not get to brag about being a pitmaster yet, you would be able to produce excellent tasting meat instead. After all, a pellet grill provides you with juicy and tender meat without requiring you to babysit your smoker. 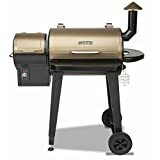 Choosing the best pellet grills and smokers, we understand, would not be a quick and easy task for a beginner or someone who just does not have the time to compare across hundreds of products. You need to consider several factors before you buy, allowing you to make a great choice while preventing you from making an expensive mistake. Luckily, we have provided you with everything you must know when choosing the best ones on the market. Read on if you want to know more. As the name suggests, a pellet smoker operates by burning wooden pellets. Generally, a pellet smoker is equipped with a hopper found on its side where you add the wooden pellets. Once you turn the appliance on, these pellets will then move from the hopper to the burn pot where they will be ignited and the smoke produced is going to be diffused by a built-in fan. As with any other grill, it also comes with a thermostat, which measures the grill’s temperature, as well as an indication as to how many more pellets should be burned to keep a consistent temperature. 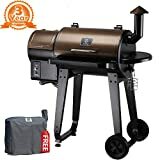 Probably the best thing about getting a pellet smoker is that you are never required to do much to get excellently smoked food. All you need to do is to set the digital controller to your desired temperature and then leave it to the smoker to do the rest. Simply put, this kind of smokers are “set-and-forget”, allowing you to spend more quality time with your guests and family and still serve them meat that is perfectly smoked. Another advantage of having a pellet smoker is that you can also use it as a grill. When grilling, the pellet smoker has the capability to start up quickly while not requiring you to watch your food while grilling. Depending on the model, you may use either the area at the fuel pot to grill your meat or you place a griddle on top of the pellet smoker when operating on a high temperature. The most important thing to look out for when choosing a pellet grill and smoker is whether it has the capability to maintain your desired temperature. In fact, pellet smokers are very popular among consumers because it allows them to smoke meat for a long period at maintained low temperatures. Knowing the type of controller your pellet smoker comes with is also another important factor to take into consideration. Three-stage controller. This one comes with three options: low, medium, and high. Because you only have three options, it might provide poor performance when you need to maintain the chosen temperature. Multi-position and digital controller. This type of controller allows you to set the temperatures at +/- 25°F intervals. Its advantage would be the incorporation of innovative solutions such as a digital timer, better smoke control, as well as alerts. PID controller. Considered as one of the best pellet grill controllers, it accurately maintains the temperature at +/- 5°F intervals. This one would be perfect if you wish to smoke your meat longer and slower while at low temperatures. As you may already know, these pellet grills come in different sizes, from the portable kinds to the large ones normally intended for commercial use. If you are looking to bring a pellet grill with you when you are camping, then you might want to consider choosing a portable one. On the other hand, if you like hosting gatherings at home, then you might opt to buy a bigger pellet grill and smoker. 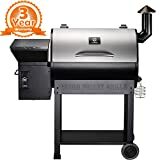 If you like to take advantage of modern technology when choosing a pellet smoker and grill, you might want to consider choosing one that comes with control boards with meat probe units, direct grilling capabilities, Wi-Fi capabilities, programmable meat probes, and ancillary cooking racks. 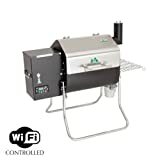 We consider the Davy Crockett pellet grill created by Green Mountain Grills as one of the best pellet grills for the money because it allows you to control your grill using Wi-Fi connection with its third-party Android or iOS application. It can be connected via 110v or 12v outlets and every purchase comes with adapters for different power options. It is equipped with legs that can be folded for easier transportation. The Davy Crockett pellet grill features the Sense-Mate technology, which is an integrated thermal sensor that will monitor your grill’s temperature, allowing foolproof cooking. In addition, this grill comes with a meat probe, a peaked lid, rick racks, an open-flame technology grease tray, as well as a tray with utensil hooks. The Z Grills pellet grill and smoker comes with the smart-smoke technology, which uses an automatic electric feed system, enabling you to maintain constant temperature ranging from 180 °F to 450 °F. It also is equipped with a hopper that holds up to 20 lbs of wood pellets, ideal for an extended smoking time. It features a digital control that helps to ignite the wood pellets, as well as fan-forced convection that ensures an even cooking. Another great feature of the Z Grills pellet grill and smoker is that it has 513 square inches of cooking area, including a warming rack. Its cart comes with locking caster wheels, allowing portability. You can also use the lock feature to prevent it from moving, even if someone bumps into it. 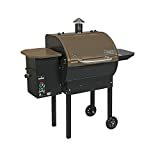 The Camp Chef SmokePro DLX 24 pellet grill and smoker features a large-capacity hopper that comes with an ash cleanout system. It also is equipped with an electronic auto-start ignition, which allows easy and quick startup. Another great feature of this pellet grill and smoker is its dual LED temperature readout that shows internal cooking temperatures, as well as food temperatures. We consider this one of the best pellet smokers because it uses a very simple temperature selection system that has the capability to maintain the heat. It also uses an automatic auger that dispenses pellets if needed for an enhanced smoker efficiency. Lastly, it comes with a total of 570 square inches of cooking space. The Green Mountain Grills Davy Crockett Pellet Grill Package comes with the GMG Wi-Fi grill, a black grill cover, and a black tote bag. Indeed, it is the ultimate portable grill and it comes with a digital Wi-Fi controller, which can be monitored and controlled via a third-party Android or iOS application, a meat probe, a tray with utensil hooks, as well as a peaked lid for rib racks. Just like the previous GMG product, it is equipped with the Sense-Mate technology, the thermal sensor responsible for constantly monitoring the grill’s temperature. In addition, it can run on both 110 V and 12 V outlets, making it perfect for camping, tailgating, music festivals, and even at home. It weighs around 57 lbs. while featuring foldable legs for portability. Lastly, it comes with a 2-year warranty from the manufacturer. 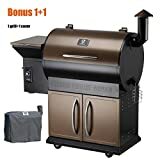 What made us consider the Z Grills ZPG-450A as one of the best pellet grills for the money is because it is the ultimate 7-in-1 wood pellet grill, mainly because of you can barbecue, bake, roast, braise, smoke, grill, and sear on it. It comes with the fan-forced convection cooking, eliminating the need for a rotisserie while creating a more versatile environment for grilling. It also comes with a precise temperature control, thanks to its digital control board that has the capability to automatically ignite while allowing you to set the temperature from 180 °F to 475 °F. In addition, it features an automated electric feed system that effectively maintains the heat and produces the optimal amount of smoke. Plus, it comes with 450 square inches of cooking space, including a 15-lb hopper capacity, a foldable shelf, as well as heavy-duty wheels, rust-resistant cover, and racks. When you think nothing can beat the previous Z Grills product, let me introduce to you the 8-in-1 pellet smoker offered by the same brand. It has the same specs as the previous one but this one has char-grilling capabilities. It comes with a huge 700 square inches of cooking space and the manufacturer offers a 3-year warranty on parts. As with the previous Z Grills pellet grill, this one is also very easy to use, thanks to the electronic auto-start ignition system, digital automatic temperature control, and precise LED temperature readout. It is also very easy to clean because of its special-designed waste oil collector. It is made of stainless steel that is resistant to corrosion. The Cuisinart pellet grill and smoker is a 6-in-1 grill and smoker because it allows you to grill, roast, smoke, braise, bake, and barbecue. It features a large 450 square inch cooking space, including a 15-lb hopper capacity. It is also very portable, with its all-terrain wheels and lift handle. Lastly, it comes with a stationary side shelf and a collapsible front shelf. When choosing the best pellet grills and smokers, we are sure that you will come across several models that have different sets of features. Luckily for you, we have rounded up the best ones on the market right now to help you make the decision making a lot easier. All you need to do is to review the features, pros, and cons of each product to be able to come up with a wise buying decision.